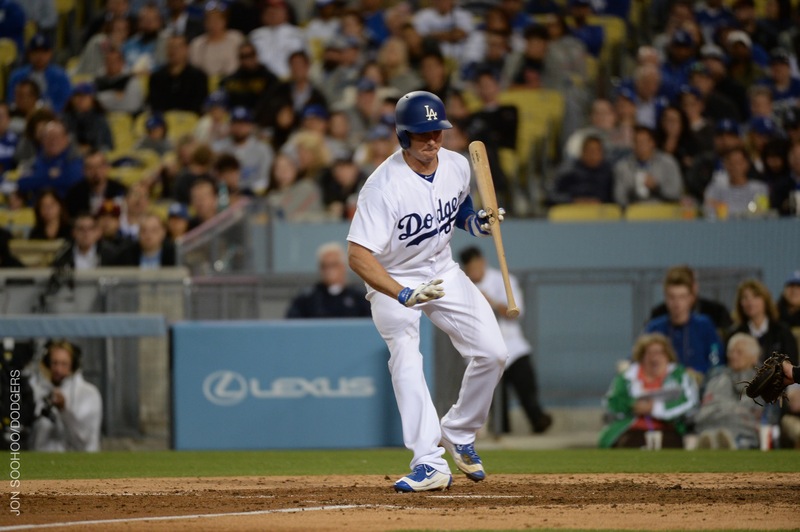 The Dodgers remained stymied on their current homestand, losing tonight to the Padres, 5-2. Ross Stripling had a career-high six strikeouts, but couldn’t stay out of trouble in the third and fifth innings, and the Dodgers didn’t score after Chase Utley’s two-run homer in the bottom of the third. Clayton Kershaw takes the mound in the homestand finale Sunday. Oddly, to say the least, the Dodgers finished April tied for first place in the National League West, despite a 12-13 record. In the wake of their four-game losing streak, the Dodgers held a closed-door meeting at 3:30 p.m. in the clubhouse that Dave Roberts said essentially addressed the same issues he brought up after Thursday’s game. One thing not addressed in today’s meeting was the 80-game suspension of former Dodger infielder Dee Gordon that was announced late Thursday. 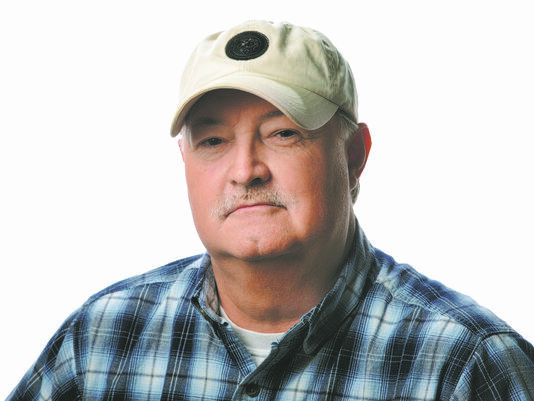 Reaction to that news is amply covered at a number of sites, but Roberts echoed the feeling of many. Two nights ago against Miami, the Dodgers scored two runs in the first inning, saw their starting pitcher take a one-hit shutout into the sixth, and lost. Tonight, the series finale with the Marlins brought an unwelcome repeat. 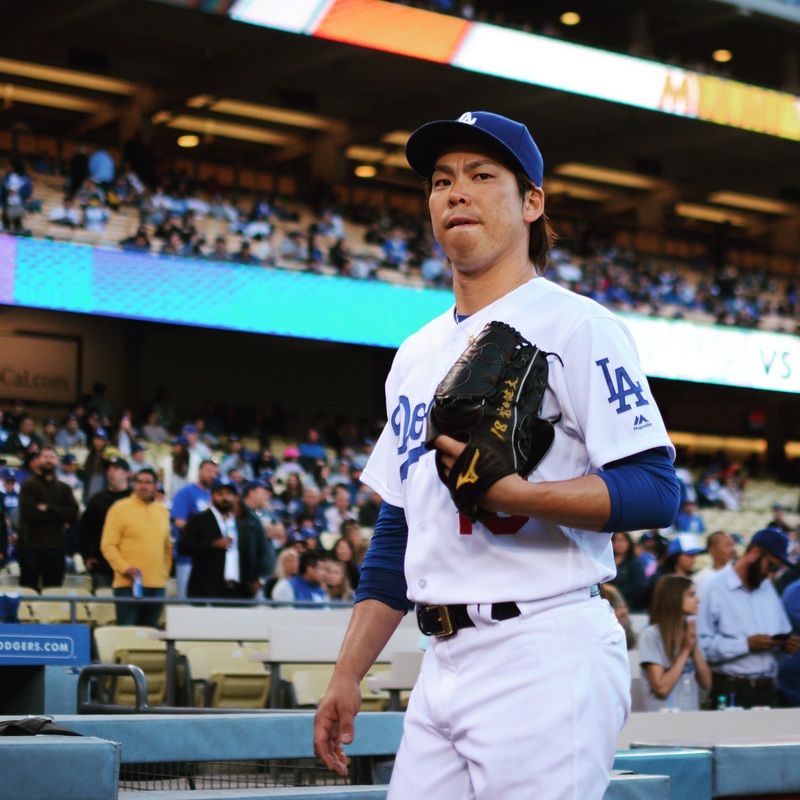 The magic elixir of Kenta Maeda could only take the Dodgers so far. 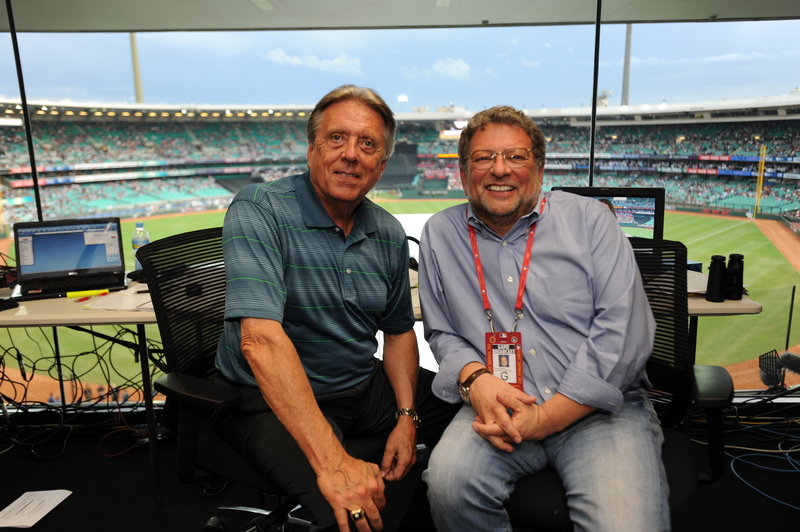 Rick Monday and Charley Steiner have signed new multiyear contracts to remain the Dodgers’ radio broadcast team. The pair will continue calling games on the Dodgers’ flagship station AM 570 LA Sports and across the Dodger radio network. Lost among Wednesday’s weirdness was this: According to my research at Baseball-Reference.com, when Chase Utley, Yasmani Grandal and Joc Pederson each saw ball four in the eighth, it was the first time three pinch-hitters had walked in the same inning in Los Angeles Dodgers history. Twenty other times since the franchise began play in Brooklyn, the Dodgers had gotten at least three pinch-walks in a game — one time, they had four — but only twice before did they have three in the same inning. Yeah, I know, how trivial — but what can I tell you? This is the kind of stuff that interests me. The only other times this happened in franchise history were in Brooklyn, and both times were real doozies. Despite an eighth inning that featured three pinch-hit walks and two Miami ejections, the Dodgers were unable to rally from their 2-0 deficit tonight and lost their third straight game to the Marlins. It’s the first shutout and first three-game losing streak for Los Angeles, which remains in first place in the National League West, though the lead has shrunk to half a game over San Francisco, which has won three in a row. The worst fears about Scott Kazmir were both realized and replaced tonight. After allowing four singles (and two runs) to the first five Marlins he faced, Kazmir went on to shut out Miami for the remainder of his six innings. Throwing 113 pitches, his most since September 11, 2014, Kazmir finished with six strikeouts, retiring 16 of the final 21 batters he faced, including a 4-6-3 double play to end the top of the sixth. The effects of Kazmir’s left thumb/wrist ailment were seen most when he came to the plate, where he did no more than show bunt, even with no runners on base. Unfortunately for Kazmir and the Dodgers, he left trailing, 2-0. Left-hander Justin Nicolino stymied the Dodger offense in his 7 1/3-inning season debut, despite striking out only two, shutting out Los Angeles on 99 pitches by allowing only singles by Corey Seager and Justin Turner and walks to Kiké Hernandez and Adrian Gonzalez. When is a platoon not a platoon? According to Dave Roberts, when it isn’t quite a platoon. Though the Dodgers have leaned heavily on lefty-righty matchups in constructing their offense this season, Roberts explained today some of the distinctions that he sees. 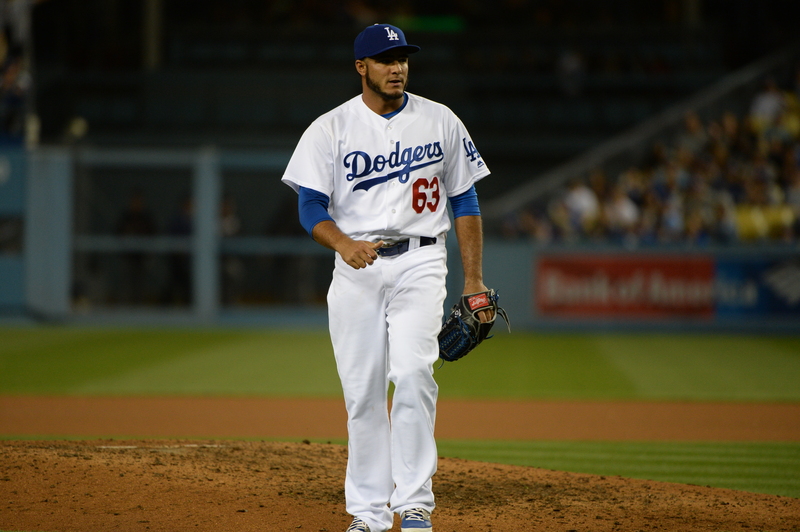 The trouble with Yimi Garcia’s pitching arm remains localized in his bicep, Dave Roberts said this afternoon, but so far there’s been no progress for the 25-year-old righty since he went on the disabled list April 23. Garcia has a career 3.12 ERA (120 ERA+) with 81 strikeouts in 75 innings for Los Angeles. As for the active members of the Dodger bullpen behind Scott Kazmir tonight, all should be available for action, with the possible exception, I would expect, of Louis Coleman, who threw 10 pitches Monday and 20 Tuesday. 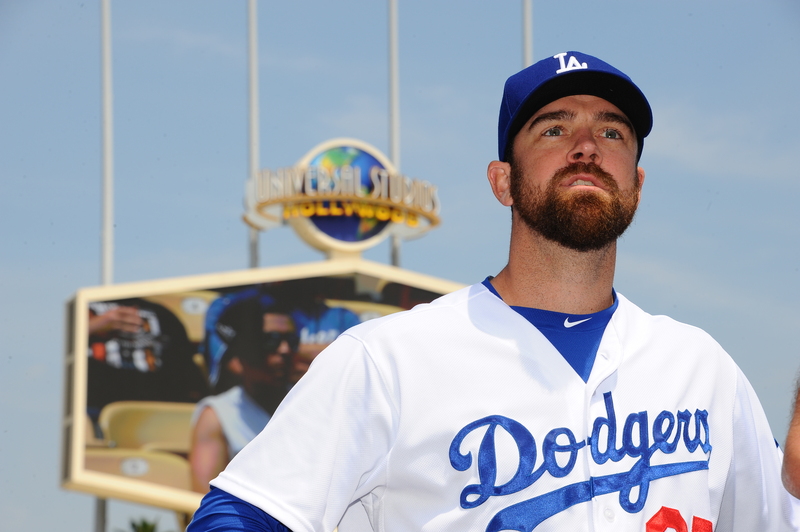 J.P. Howell has also worked the past two games, but with only nine pitches combined. As he indicated Tuesday, Roberts is looking for an improved performance from Kazmir, who pitched six shutout innings in his Dodger debut but has allowed 14 runs in 13 innings since. When Miguel Rojas pinch-hit for Miami with one out in the top of the sixth inning tonight against Clayton Kershaw, it seemed little more than a happy reunion. Kershaw was pitching like he did the night of June 18, 2014, when Rojas’ dazzling defensive play at third base was the one Kershaw needed to preserve his first career no-hitter. If not for a fly-ball triple to left field in the second inning, the Marlins would have been hitless this evening as well. 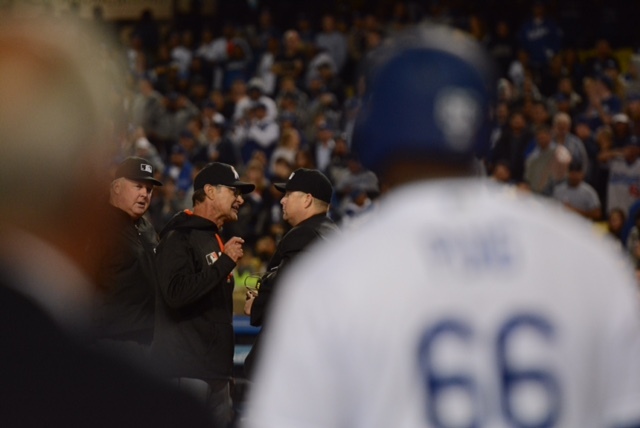 It would have been some kind of irony had Rojas broken up a Kershaw no-hitter tonight. With that off the table, Rojas did something far worse. Rojas’ broken-bat double — his first extra-base hit in 62 plate appearances, dating back to September 18 — started a five-run Miami rally that Giancarlo Stanton finished with a 433-foot, three-run home run, in what would become a 6-3 Dodger loss. Stanton had gone 0 for 2 against Kershaw in the game, looking mismatched on a fourth-inning strikeout, and was 4 for 17 with one homer and three RBI in his career against the lefty. This time, there was no foolin’. Still, it was stunning. 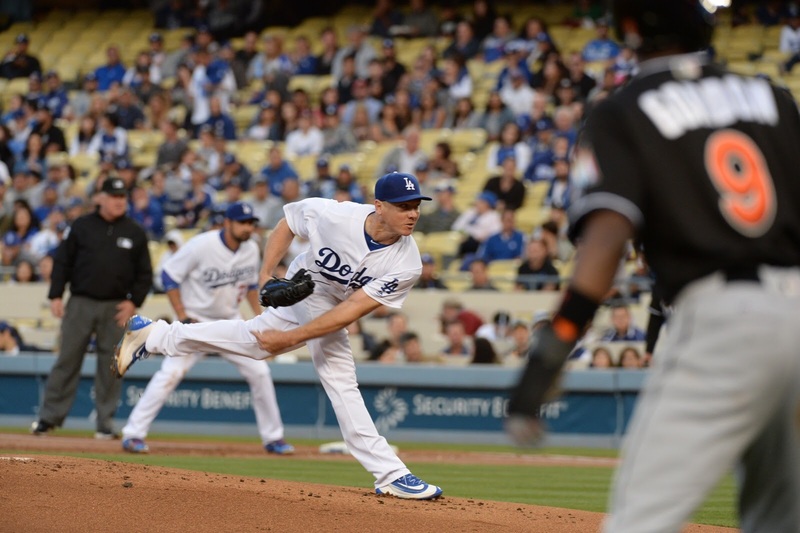 Before Rojas’ double, Kershaw had retired 16 of 17 batters — eight strikeouts, eight infield outs. His season ERA was down to 1.27. 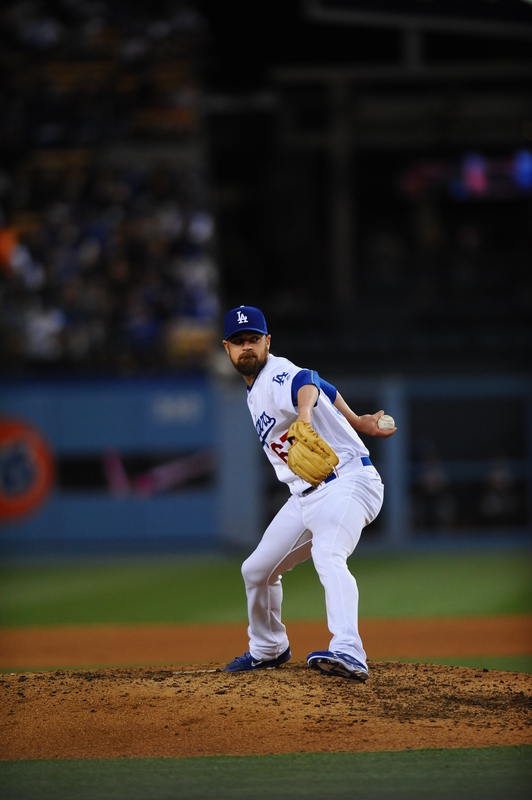 He had already become the first Dodger to average seven innings per April start since Derek Lowe in 2005, and he would go on to whiff 10 in all, setting a Dodger record for starting pitchers in April with a 13.33 strikeout-to-walk ratio (40 strikeouts/three walks). In fact, for the first five innings, this had been a night to revive the “Kershaw MVP” chants. In addition to his pitching dominance, Kershaw had gone over his head to knock down a first-inning comebacker for an out, and also had two hits — a butcher-block single to left in the second inning, and a booming RBI double (97 mph in exit velocity) in the fourth. That had given Los Angeles a 3-0 lead, though no doubt the Dodgers regretted not having more. Marlins starter Tom Koehler walked three of the first four batters he faced to start the game and sent two home on wild pitches. But Kershaw would have the Dodgers’ only RBI of the night. After Rojas’ double, Dee Gordon (who was 0 for 2 and in an 11-for-57 slump) hit a two-strike comebacker off Kershaw’s leg for an infield single. Martin Prado and Christian Yelich followed with RBI singles, setting up the confrontation-turned-conflagration with Stanton. With Kershaw having allowed five earned runs all year to that moment, those five batters literally doubled his ERA. 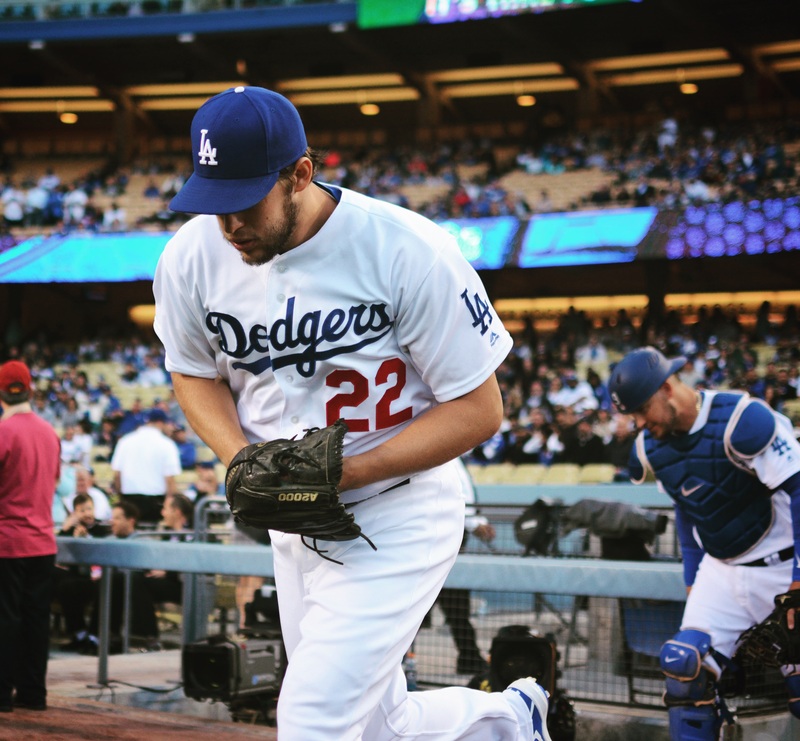 Clayton Kershaw has thrown at least seven innings in each of his four starts this season, and the Dodgers would love for him to make it a fifth. It would be going too far to say they need him to, but … it sure would be nice. Of the Dodgers’ 20 games this season, starting pitchers have gone at least six innings 11 times — twice in the past seven games. “I think those guys would be the first to tell you, we’ve got to get length,” Dave Roberts said. “Obviously, we came from (three games in) Denver, but I think to win a lot of games and to go deep in the postseason, we can’t beat up our pen, and so that starts with the starting pitching. 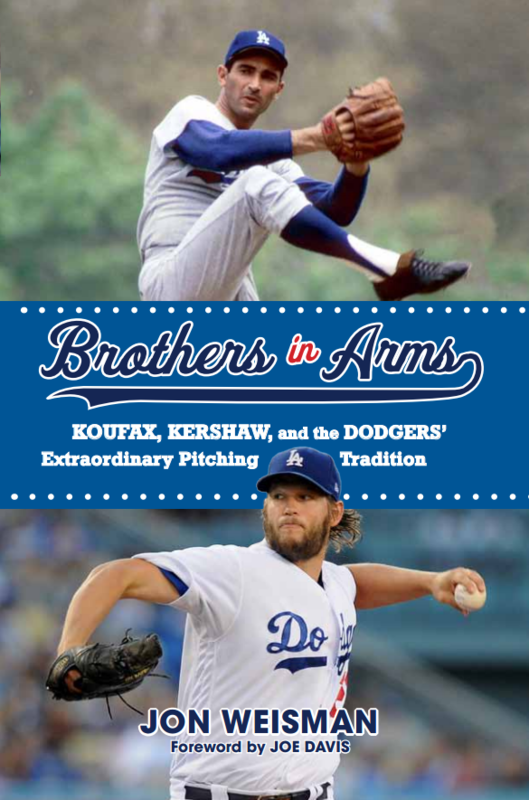 Next after Kershaw comes Scott Kazmir, who has been bothered somewhat by a sore left thumb and wrist. Kazmir through off flat ground today and is ready to make his scheduled start Wednesday. 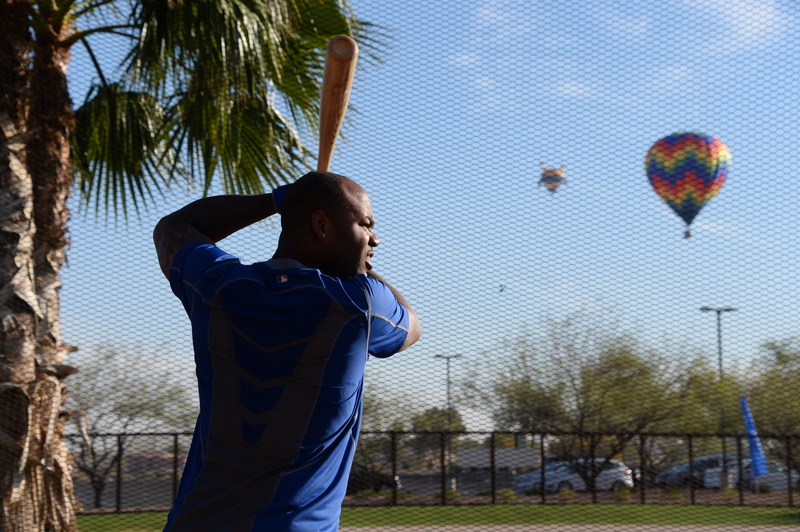 Carl Crawford has been activated from the 15-day disabled list, with Zach Lee returning to Triple-A Oklahoma City. Crawford started (but didn’t finish) the Dodgers’ first three games of the 2016 season and pinch-hit in the fourth, going 3 for 11 with a double. “Just seeing him jump around and want to be back with the guys and be an active player again, it’s exciting, and we look forward to getting him back in the lineup,” Dave Roberts said. 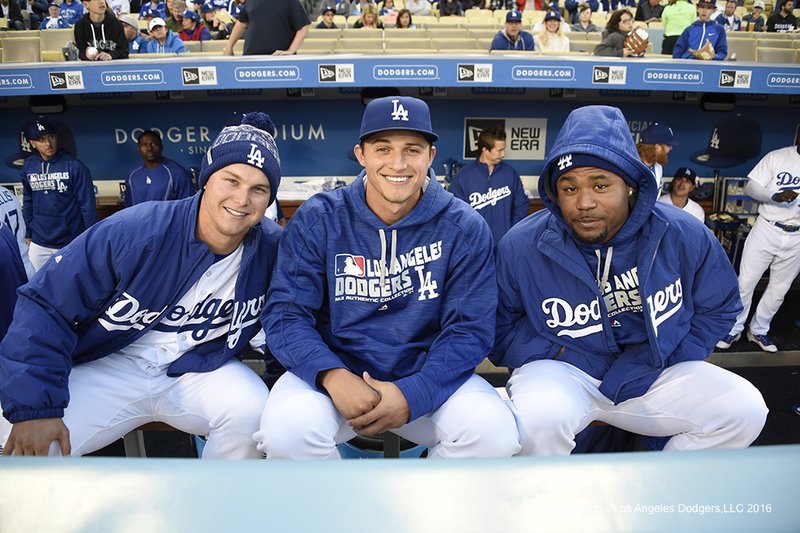 Roberts talked about how Crawford would fit into an increasingly crowded rotation in left field, with Howie Kendrick, Trayce Thompson and Kiké Hernandez. Roberts later added that optimally, Crawford would start three or four times a week. 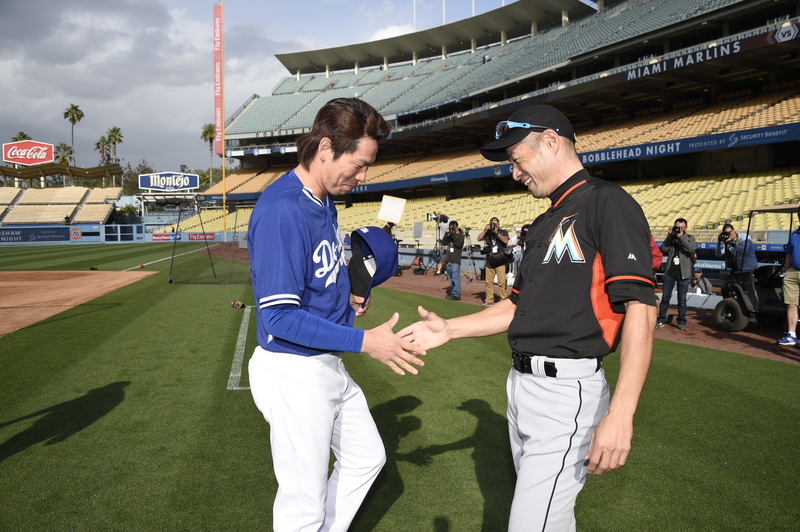 Lee was with the big-league club for four games but did not pitch.